Normally, when one thinks of a vampire the words ‘cute’ and ‘adorable’ are far from their mind, but your little one is about to change that real quick. Take a look at this Count Cutie Costume. You’ll have the most lovable vamp in town! From everything we’ve researched (and by 'research' we mean binge watching horror films), in order to turn into a vampire you have to go through a whole lot. Apparently, there’s a bunch of biting involved that we don’t want to get into. But what we’re trying to say is that we’ve found a much easier way to make the transformation. Just toss this adorable costume on your youngster and BOOM! You’ve got a little Count Cutie by your side. The best thing about this costume, aside from how lovable your little guy will look, is that it now comes bloodlust free! So you won’t have to worry about your little bundle of joy trying to make you into an adult-sized juice box. 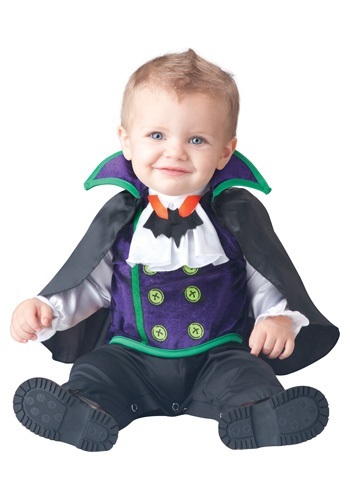 Now then, what this costume does come with is a jumpsuit that has just about everything your little Dracula needs! A white satin shirt, vest with printed on buttons, a playful bat ‘pendant’, and stylish black pants. The only other thing he needs is a cape, which just so happens to be included. Turn your lovable little rugrat into the king of the night with this Count Cutie Costume. He’ll be so adorable that even Van Helsing wouldn’t think about hurting a hair on his precious little head!